What is Efficiency and How Does it Work? Often, when people hear the term “energy efficiency” they immediately begin to imagine a loss in comfort, sacrificing things they enjoy, like watching television or using the computer less, however, while energy conservation is important and is a large part of energy efficiency, the term energy efficiency does mean using less, however decrease is achieved through the use of technology, and saving energy when it’s not in use. This page of the wiki provides information on energy efficiency, explains concepts, policy and has some guidelines that you can follow to save energy and money, and discusses existing efficiency programs, and other sources of information on energy efficiency. To understand how energy efficiency works, it's important to first review how energy works. The goal of energy conservation and efficiency is to decrease the amount of energy used Examples of energy efficiency policy or best practices are reflected in building codes, appliance and equipment standards, and efficiency mandates. Energy efficiency also means operating and maintaining facilities or homes in the most efficient manner, by adding insulation, maintaining boiler systems and testing the air flow. Alaska's energy policy has traditionally focused on energy supply as opposed to efficiency. Many Alaskan communities rely on diesel generation. When diesel prices are low, conservation and efficiency efforts are often looked over. However, fuel prices have been steadily rising making efficiency extremely important.1 Efficiency requires energy users to commit to using efficiency measures to insulate their homes and utilize energy as efficiently as possible, regardless of the price of fuel. Between 15-35% of heat can be lost through poorly insulated or fitted windows during the winter. By using insulated blinds or curtains, caulking around the window frame to block drafts, or installing double or triple paned windows, families and businesses can prevent heat loss. This doesn't change the cost of the fuel a user must purchase, but it may help energy (heat, in this case) be used more efficiently in a building leading to lower fuel consumption, saving money for that user. Energy efficiency measures can range from the practically free or very cheap to expensive installations. The approach that is most appropriate varies by the building and the desires of the user, but all efficiency measures will help to use energy (heat, light, etc.) more efficiently and can help lower energy costs. This is particularly useful in rural areas of Alaska where fuel prices can be very high, and capturing heat and light effectively is very important. government-initiated incentives encourage the development and adoption of energy efficient technologies and practices. These can be put in place at the national, state, or local level. Many of these policies however, are more effective at a state level, where more specialized policies can be shaped to a specific states need. Policy for energy efficiency can be categorized using eight different fields: (1) utility-sector and public benefits programs and policies; (2) transportation policies; (3) building energy codes; (4) combined heat and power strategies; (5) appliance efficiency standards; (6) leadership by example in government facilities and fleets; (7) technology research, development, and deployment; and (8) financial and information incentives. Energy efficiency and renewable energy are equally important aspects of successful energy policy. Improving energy efficiency in existing infrastructure is an important step to solving common critical problems like energy security, climate change, and fossil fuel depletion and the associated high cost of depletion. Improving efficiency is among the first steps Alaskans need to take before new infrastructure is developed. The Alaska legislature has provided funding and resolutions to help Alaskans insulate their homes and conserve energy through better efficiency practices. Several programs exist that help home and business owners make their buildings more energy efficient. Tax credits and subsidies exist through various energy support entities to help offset installation and initial capital costs. See more about such programs further down the page. Energy efficiency should be viewed as an investment, in which an initial cost is weighed against a subsequent reduction in expected energy use. Costs may continue to rise, but high costs can be mitigated by energy efficiency efforts. Increased end-use energy efficiency will bring net economic benefits to Alaskan homes and businesses. Energy conservation focuses on where the energy goes. 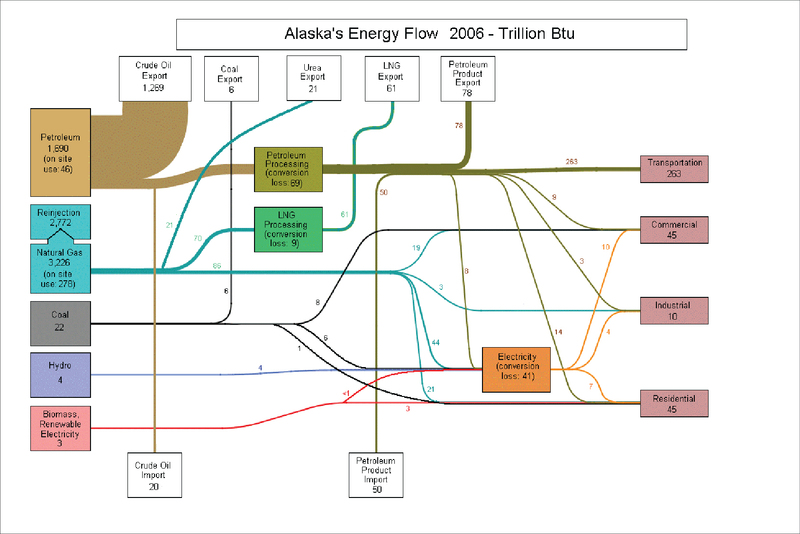 The red area in the figure below highlights sectors on the demand side of the Alaskan energy flow. The cheapest unit of energy is the one unused. Increase efficiency and conserve in order to lower the cost of energy. Resource potential exists throughout the State. Energy conservation and efficiency are ongoing projects that are changing and developing constantly. Mature – energy efficiency requires more mind-set than technology. The most important infrastructure will be an educated public. Education and marketing are valuable components of end-use energy management. End-use efficiency also requires proper design to consider user needs and comfort. Proper disposal of old equipment is necessary. The result is a reduction of energy used, the amount of fuel used, and related emissions. The rate of return for conservation and efficiency is extremely high. This is a necessary step to take before any kind of new infrastructure is considered. That said, payback depends on energy efficient measures. Lights: Changing light bulbs is an easy step that you can take to save energy and money. Traditional incandescent light bulbs are very inefficient, in fact, the more expensive compact fluorescent bulbs, while initially more expensive, are 75% more efficient and can last 10 times as long, and can save users a significant amount of money. To learn more about choosing the right energy efficient lights for your home or office visit AK Energy Efficiency’s Guide to Efficient Lighting. Home Energy Assessment: If you’re not sure what parts of your house need improvements, a Home Energy Assessment is a good place to start. Energy Raters can determine which areas in your house are costing you the most energy, and recommend improvements. To access a list of qualified energy raters, please click here. Once raters have pinpointed areas in your house, you can then work to address them. You may be eligible for the Alaska Housing Finance Corporation Home Energy Rebate program or the home weatherization program. 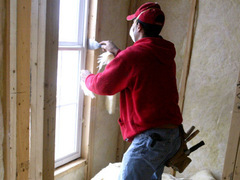 Weatherization: Ensuring that your home is adequately protected from the elements is essential. Weatherization keeps hot air from escaping, and cold air from getting into the house. Weatherization can save homeowners thousands of dollars. Air Leaks: One of the most important things that you can do to save energy, is locating air leaks and sealing them. Leaks often occur around doors and windows and vents. To keep warm air from escaping, proper caulking is required around windows, and proper sealing is needed around doors. Windows: Windows are a big source of energy loss. Using the right windows in Alaska is very important. To learn more about windows in Alaska, use this guide: Selecting Energy Efficient Windows in Alaska. Windows with high efficiency ratings can be quite expensive, some less expensive options for saving energy are Using a transparent plastic film on single pane glass windows can help save energy, as can insulated blinds. Insulation: Proper insulation is important in Alaska. The Alaska Housing and Finance Corporation (AHFC) has developed building standards that lay out the minimum amount of insulation needed in Alaska called the Building Energy Efficiency Standard (BEES) Alaska is divided into four different zones each with a different R value. The R value is the rate at which a material conducts or transfers heat energy. The higher the R value, the better insulated a house is. To learn more about Insulation and the BEES standards please read the Alaska Building Energy Efficiency Standard Handbook. Phantom Loads:Phantom Loads represent the electricity that appliances use, even when they are powered down. Appliances like microwaves, TVs and VCRs, or coffee makers that have clocks, or lights that remain on while plugged in generally have phantom loads. You can determine whether appliances have a phantom load by using a Kill-A-Watt meter. By plugging the meter into an outlet and plugging the appliance into the meter, you can learn how electricity is being used. To eliminate phantom loads unplug appliances. Power strips can also be used by plugging appliances like your TV and DVD players into the strip and switching the strip off when appliances are not being used, saving the hassle of finding the correct plugs. Energy Efficient appliances: One important area of potential improvements, is the use of energy efficient appliances. Replacing washers, dryers, furnaces, boilers, etc while an investment save money over time. Visit the Energy Star web page to learn about energy efficient appliances. Visit the Find Energy Star Products page to find specific products. A significant portion of fuel oil used in rural Alaska is for space heating. Recovery of wasted heat from diesel power generation has great economic potential for remote Alaskan communities. The recovered heat can be used for space heating, domestic hot water, or for tempering municipal water supplies to prevent freezing and facilitate treatment. The efficiency of recovering waste heat for augmenting electrical power production is lower than that for heating; however, it can be attractive and economical in some places since electrical power is needed all year, and heat is only needed in the very coldest months. Heat recovery may use one or all of the diesel generator’s waste heat sources including the exhaust stack, jacket water, and charge air. Waste heat recovery using jacket water heat and/or charge air heat directly for heating is a mature and proven technology. Over a quarter of rural village diesel generators have already been equipped with jacket water heat recovery systems. Charge air heat has been recovered for heating in a select number of communities. Water Jacket Heat Recovery:For rural Alaska, the technologies systems that use recovered heat directly are most applicable. Modern high-efficiency heat exchangers, super-insulated heat piping, high efficiency electric pumps, modern electronic BTU meters, and variable speed radiator fan motor controllers maximize the utilization of heat available from diesel engines. Waste heat recovery for space heating is a common, proven design. The associated design and maintenance procedures are well understood in the Alaskan power industry. For this reason, water jacket heat recovery for space heating is considered a mature technology in Alaska. Exhaust Stack Heat Recovery: Heat recovery from diesel engine exhaust stack is a proven and cost-effective technology in larger power plants. Recent technological improvements have made exhaust stack heat recovery feasible and economical in midsize engines, which are used in rural Alaska. These advances in exhaust stack heat recovery have boosted recovered heat and reduced the hazards and maintenance burdens typical of the older systems. At this time, only one production diesel generator in Alaska, apart from the University of Alaska diesel test bed, is known to employ an exhaust stack heat recovery system for heating applications. This is a relatively large 5 MW power plant at a mining site. No heat recovery performance data for that installation was readily available for this publication. Heat to Electricity Technology: There are technologies that allow for waste heat to be converted to electric power. These are the organic Rankine cycle (ORC), Kalina cycle, exhaust gas turbine, and direct thermoelectric conversion systems. For years, engine heat recovery for power generation has been applied to very large power plants and marine engines. Many heat recovery power systems have capacities over a megawatt, including combustion engines powered by natural gas, coal, and petroleum-based fuels.The performance of waste heat to power systems is relatively sensitive to exhaust temperature and the energy content of the heat sources. For mid-sized engines, technologies for converting waste heat to electrical power are not yet considered mature technologies. Feasibility of these systems is highly dependent on fuel cost. Current research and development groups include engine manufacturers and power plant companies. The University of Alaska Center for Energy and Power is also assessing the performance of heat-to-electricity technologies from several manufacturers. To learn more about heat recovery please visit our heat recovery technologies page. Often efficiency retrofits have large upfront costs inhibiting rural communities from investing in efficiency measures. Education is also a large inhibiting factor. Programs exist to help residents with the costs of weatherizing their houses. Some of these programs offer rebates, others pick up the costs of weatherization for low income families. Developing a strong belief in efficiency measures, and upgrading current community power generation and infrastructure is important. Numerous private and government funded programs exist to help home and business owners make their properties more energy efficient. Provided here is a short list of energy efficiency programs with a brief synopsis of each. The Alaska Housing Finance Corporation : This page provides information about grants, rebates, and income-based weatherization programs to help improve private homes. Weatherization Programs : A comprehensive listing of programs that will provide information and weatherization services to homeowners. Alaska Energy Authority : The site for Alaska Energy Authority Efficiency and Conservation Block Grants. Contact the individuals listed at the bottom of the page for information about the presented material. Alaska Energy Efficiency : This website provides a compilation of energy and efficiency programs that can help home and business owners be more efficient in their energy use. Alaska Renewable Energy Project (REAP) : A great resource for Alaska specific energy and energy efficiency related issues. There are several opportunities for Alaskans to receive energy efficiency education. Many of the programs above offer energy efficiency classes for homeowners and individuals interested in employment in construction. The Alaska Center for Energy and Power (ACEP), Renewable Energy Alaska Project (REAP) and Alaska Housing and Finance Corporation developed a K-12 Energy Efficiency Curriculum called AKEnergySmart. This curriculum covers a variety of topics with engaging lessons for students. It is available for no cost on the AK EnergySmart webpage. The future of Alaska demands that every resident get the most energy out of each unit purchased. Energy efficiency has the highest return on investment of any energy source. The environmental implications are extremely high as well. Many facility owners and operators tend not to think about their usage, yet it is the easiest and fastest way to keep costs down. End-use efficiency can keep energy prices stable while reducing the need for new supply-side infrastructure, or providing the extra time to build that infrastructure. Careful project design can mitigate comfort issues that may arise from new lighting systems and different building controls. The technology is mature, but constantly evolving. Owners and operators must keep current on the changes. Before implementing changes they must assure proper testing has been completed. Conservation has a strong future in slowing the advancement of global warming by reducing or displacing production of greenhouse gases from the electricity sector. Efficiency and conservation easily become a way of living. Constant education and outreach will be required to reinforce good habits. Safe removal and disposal (recycling) of old equipment should be ongoing. Much like the Federal Government does through mandatory reductions and use of alternatives, the State of Alaska should lead all of Alaska by example. below are the links to energy efficiency projects throughout the state.